By default, adjustment layers affect all layers below them in the Layers palette. If you need to restrict an adjustment layer to affect a certain group of layers, consider placing those layers in a layer set, as discussed in the earlier tip, "Group Related Layers into Sets." 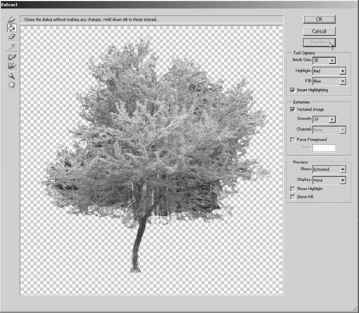 Another option is to use a clipping group, as discussed in the following tip, "Use Clipping Groups to Mask One Layer with the Contents of Another." After the new layer is added to the Layers palette, you'll notice that it has two thumbnails instead of one. The second thumbnail displays the contents of the layer mask. So to edit the adjustment or fill layer itself, double-click the first thumbnail. To edit which pixels on the layer are affected by the adjustment or fill layer, double-click the second thumbnail. Figure 6-9 shows an example of a Curves adjustment layer that affects the layer below it called car. Because the adjustment layer is contained in a layer set, it only affects those layers that are below it in the set—in this case, it's just the layer called car. Figure 6-9 This file has a Curves adjustment layer added to one of the layer sets.